Here's a soup that will definitely make you feel good. 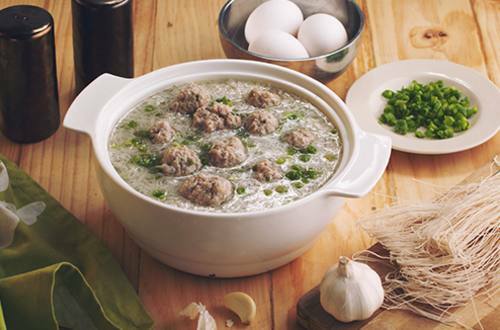 It's made with pork bola bola, misua and a flavourful broth using Knorr Pork Cubes. Taste and see what we mean. 1 Begin by making the bola bola. In a bowl, mix the ground pork, egg, spring onion & carrots, salt and pepper. With the use of a tablespoon, form into 1 tablespoon balls. Set aside. 2 Get a pan and make it nice and hot over medium heat. Pour some oil and sauté garlic. Throw in the Knorr Pork Broth Cubes and pour in the water. Allow to boil before dropping in the pork balls into the broth. When cooked, the pork balls will start to float, then add the misua noodles Turn the heat off. 3 Upon serving, sprinkle a pinch of spring onion to make a nice garnish. Enjoy a nice warm bowl of Feel Good Bola -Bola anytime of the week. It will definitely make your day.